The soybean isoflavones, daidzein, genistein, and glycitein, were hypothesized to act as cholesterol- lowering components, separate from soy protein. 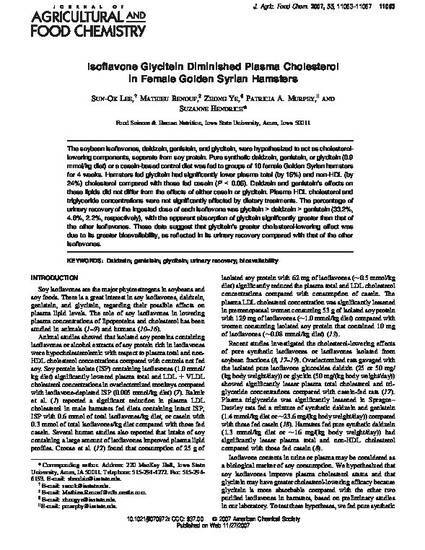 Pure synthetic daidzein, genistein, or glycitein (0.9 mmol/kg diet) or a casein-based control diet was fed to groups of 10 female Golden Syrian hamsters for 4 weeks. Hamsters fed glycitein had significantly lower plasma total (by 15%) and non-HDL (by 24%) cholesterol compared with those fed casein (P < 0.05). Daidzein and genistein’s effects on these lipids did not differ from the effects of either casein or glycitein. Plasma HDL cholesterol and triglyceride concentrations were not significantly affected by dietary treatments. The percentage of urinary recovery of the ingested dose of each isoflavone was glycitein > daidzein > genistein (33.2%, 4.6%, 2.2%, respectively), with the apparent absorption of glycitein significantly greater than that of the other isoflavones. These data suggest that glycitein’s greater cholesterol-lowering effect was due to its greater bioavailability, as reflected in its urinary recovery compared with that of the other isoflavones. Reprinted with permission from Journal of Agricultural and Food Chemistry , 55(26):11063-11067. doi: 10.1021/jf070972r . Copyright 2007 American Chemical Society. One-time permission is granted only for the use specified in your request. No additional uses are granted (such as derivative works or other editions).